Last Sunday I was in Amsterdam and the Zeedijk together with my husband. The Zeedijk is full of Chinese restaurants and shops and I always find it very inspiring to be there. The Peking ducks are hanging in the windows and the smell of 5-spices is heavy on the streets. Of course I could not stop myself from going into one of the big Chinese supermarkets. There is always so much interesting things to discover for a foodie! Unfortunately lots of the products there also include E-numbers, colorants and sugar of al kinds. Something that I try to avoid; I ended up with fresh ginger and Enoki mushrooms. Not a bad catch at all but when going home, my thoughts and stomach were still focused on the great Chinese food. So today I gave it a try. A vegan and gluten-free version of my favorite; dumplings. Instead of the high carb dough, I have used beautiful savoy cabbage to cover the filling. Even though, probably any real Chinese foodie would call me insane, I’m very contempt with the final result. It takes some work but is well rewarded in the end! 1. Start with boiling a pan of water. 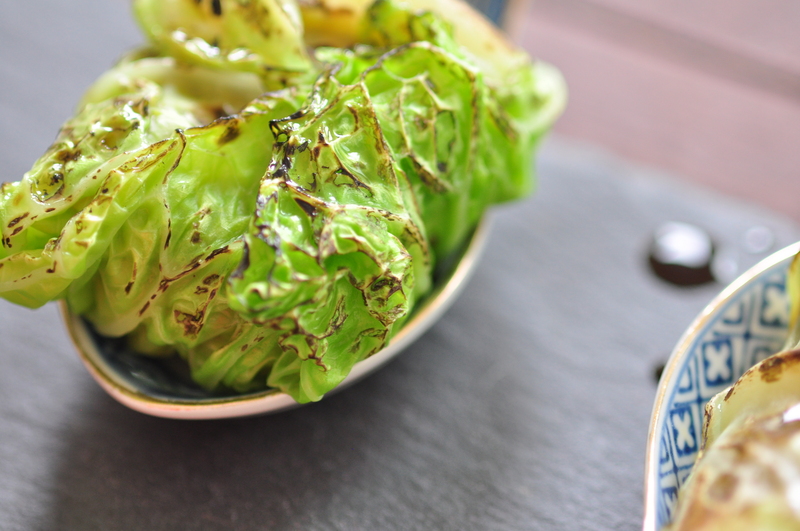 When bubbling, add the whole leaves of the savoy or pointed cabbage to the water. Blanch the leaves for a few minutes until al dente. Move the cabbage to a strainer and rinse them with cold water to stop the boiling process. 2. Set your mis en place for the filling; cut the mushrooms in small pieces. Slice the spring unions and the Chinese cabbage, see that you don’t get too big pieces! Peel the ginger and the garlic. Have your (Microplane) grater ready. 3. Add the coconut oil to the wok and set the heat rather high. When melted, add the mushrooms first. Let them bake for a few minutes before you add the spring union and cabbage. Turn the heat down and toss it around so that it won’t get burned! 4. When soft, grate the ginger and garlic into the pan. 5. Add the five spices powder, Tamari, Mirin and sesame oil. See that all veggies are covered with the spice and liquids. Possibly you need to add a splash of water to easier be able to distribute it al over. Taste it, are al the flavors there that you would like? Maybe you need to add some salt, more soya etc? 6. Set the filling aside and let it cool off. 7. Meanwhile prepare the sauce. Just add tamari, appelcider vinegar and a grated clove of garlic to a small bowl. Mix it with a spoon. 9. 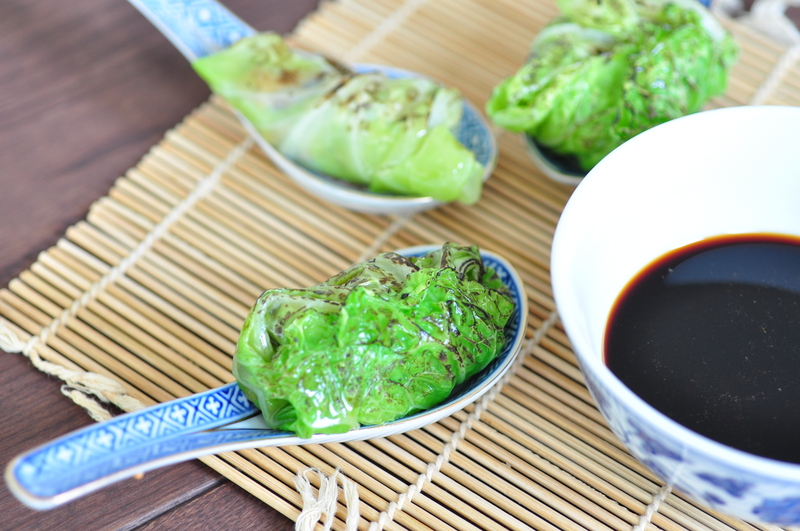 Assemble the “dumpling”; take a blanched leaf and spread it out on a cutting board. Starting at the root of the leaf, place a teaspoon of filling. Fold the leaf starting with the root followed by the left and right side and roll up. They should, when finished, be steady enough to handle without any problems. 10. Melt some butter in a skillet and place your dumplings when melted. Carefully turn when having a beautiful brown surface and equal warm. 11. Serve the warm dumplings with the sauce and enjoy! These look great. My kids have been asking for dim sum so will try these and with duck yum!